“The beauty of most of the citrus fruits used in this dish is that the peels are edible and delicious. The kumquat has a sweet skin with a tart fruit, so as you chew the sweet and sour mix, delightfully complementing one another. Our satsuma vanilla balsamic adds a little sweetness without taking over, and the fennel adds a fantastic, bright crunch. It’s simply excellent.” – Carmelo Sigona. Serves 2. For the slaw: Place the mandarin supremes in a large bowl. Slice the top and bottom off the kumquats and cut them in half lengthwise, leaving the peel on the fruit. Remove any seeds then julienne the kumquats lengthwise, give them a rough chop and add to the bowl. Fit a mandoline with a 1.5 mm or similar blade size and thinly slice the fennel. Alternatively, use a sharp knife to thinly slice the fennel into slices less than 1/4-in thick. Give the fennel a rough chop so they’re about the size of the other ingredients. Use the mandoline or knife to slice the Meyer lemon into thin rings. Remove any seeds then julienne the rings – peel and all; give them a rough chop and add to the bowl. Grate the apple and add to the bowl. Add just a touch of olive oil and balsamic, season with salt and pepper, toss and allow the mixture to rest for about 10 minutes while you cook the salmon. For the salmon: Heat the cooking oil in a nonstick skillet over medium-high heat. If using butter, heat it until the foam subsides and it turns a deep golden brown, about 3 minutes. To plate the dish, use your hands or a slotted spoon to scoop out about a 1/3 of the slaw. Give it a light squeeze to remove some of the liquid before piling it on an individual plate. 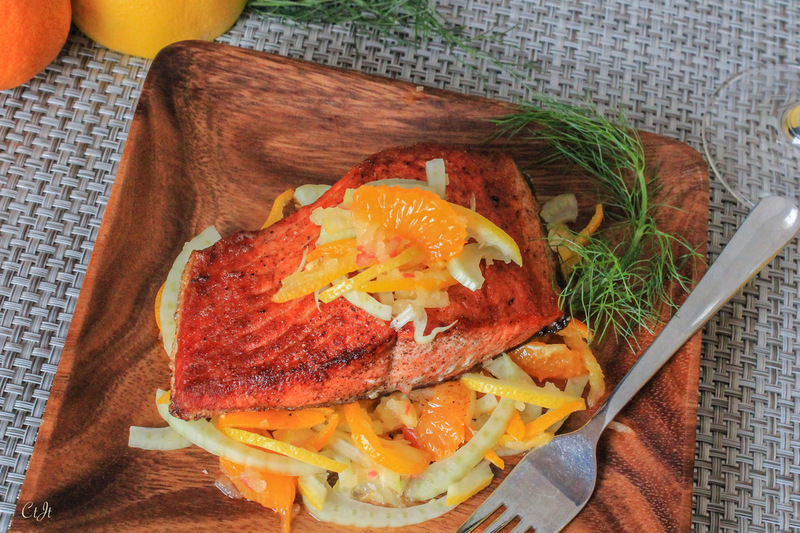 Lay a salmon fillet on top of the plated slaw and top the salmon with another tablespoon of gently squeezed slaw. Repeat with remaining slaw and the second fillet. Serve immediately, garnished with fennel fronds, if desired.